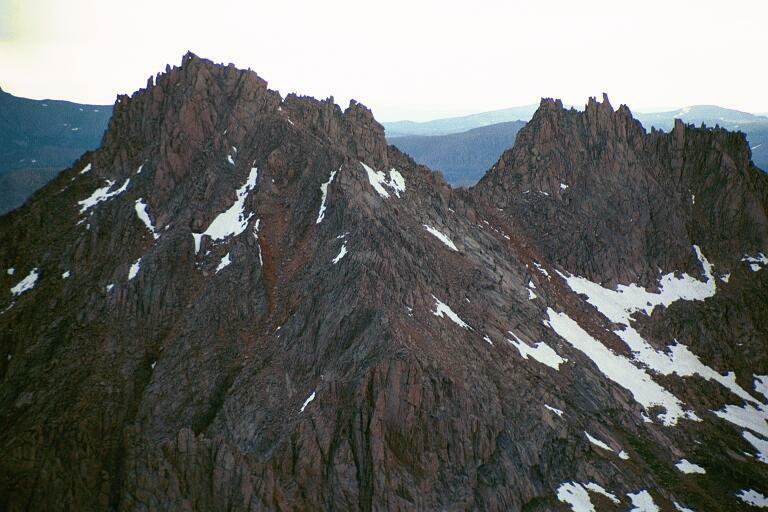 How to get there: We travelled to this peak (as well as Mount Eolus and Windom Peak) from Needleton. Needleton can be reached with the Durango to Silverton railroad. There is no road. This railroad is operated by old fashioned steam locomotives only. The trains depart four times (in the morning) from Durango, while there are four afternoon departures in the opposite direction from Silverton. What seemed to work best for us was the first train leaving at 0730 from Durango, arriving around 1000 in Needleton. We took the 1630 train from Needleton back to Durango, arriving there around 1900. The fare is dollar 60.- roundtrip for adults, half price for children under 12. There was no need to make advance reservations, we purchased the tickets the day before our departure. The trip is quite nice, the track runs along the Animas River, partly in a narrow gorge. Immediately after getting off the train, one crosses the Animas River on a good foot bridge. The trail then runs south (right) for a little less than 1 km to the point where the trail along the Needle Creek heads east up the valley. There is a trail register near this point. The trail climbs gently as it stays north of the creek. This trail is about 10 km long. As it approaches Chicago Basin, there is a smaller (less heavily used) trail that crosses the creek and heads for Columbine Pass. Do not take this trail, but continue straight. A bit further along the trail forks, there is a cairn at this point. The right fork leads to a good (and popular) area for camping a short distance further, while the left fork of the trail starts the climb towards Twin Lakes. After the first hill this (latter) trail reaches a somewhat more level area, this is the highest possible campsite. There is a sign next to the trail at this point saying that camping is not permitted higher up, including anywhere in the Twin Lakes basin. We established our BC in this area, as high as possible given these regulations. From our high Base Camp just below the sign indicating the boundary for camping, the trail continues up to Twin Lakes. The trail crosses a creek and climbs steeply p a step, then more gently between a couple of more steps before reaching the Twin Lake area. The trail continues up into the basin between Sunlight Peak and Windom Peak. Take the right fork of the trail, another fork leads deeper into the Twin Lake area. Climbing mostly on the Windom side of the basin, the most distinct trail will indeed head for Windom Peak. As soon as the basin has been reached, one should leave the trail and go left, possibly with a small descent in order to continue up the basin along its lowest line. Sunlight Spire with a very distinct "thumb" as its highest point is visible between Sunlight Peak and Windom Peak, but much closer to Sunlight. Head up the broad (south) face of Sunlight Peak, mostly on scree and broken rocks, partly between some cliff bands. The route is not very difficult to find, some quite promising "broken gullies" head up a bit further to the left (they angle up towards the right). After some initial gain, we found a good route by traversing a bit left and then following these natural features. Higher up, the terrain features larger boulders, as the number of possible routes shrink, one is quite naturally led up some big boulders to a place where one sees a hole under a large block of rock. Scramble up here and go through the hole. As one exits there is a good ledge heading left, this route now easily leads to the area immediately below the summit block. The summit register is located in this area. 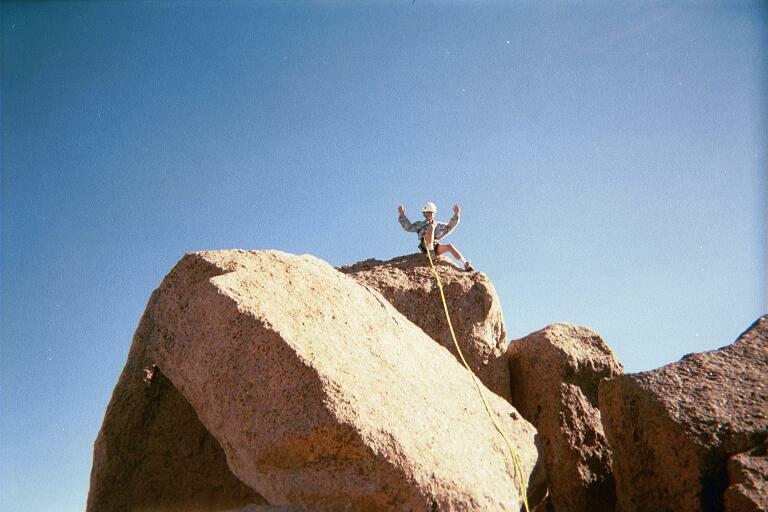 To further gain the proper summit requires an easy scramble up a tilted block to a ledge. The summit structure can be observed from here. There is a huge hole under the summit towards the north, a fairly smooth slab about 4 meters long tilts up to the left, a couple of blocks provide an alternative route higher going right. The right route is supposed to be the easier ( class 4), it ends with the need to cross an exposed gap in order to get directly onto the summit. The left route (class 5) ends in a short, narrow ridge (only about 2 meter) that terminates at the summit. We chose the left route. 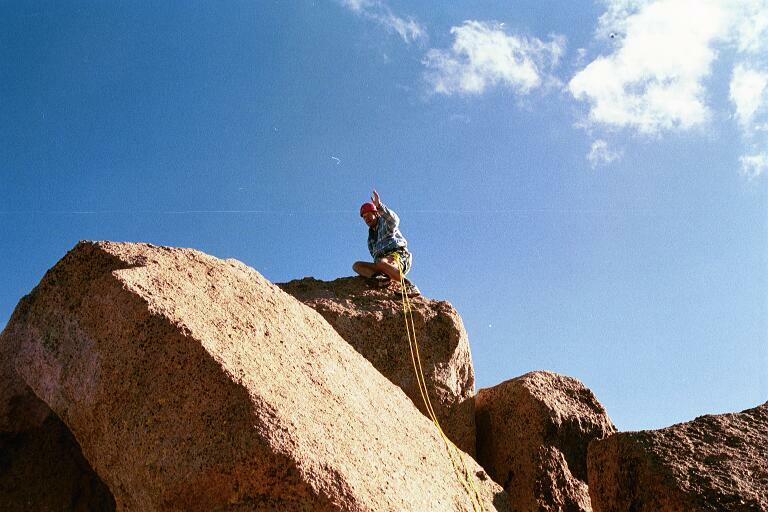 The climbing up the slab is relatively easy, at least when dry. There are small holds and good friction. However, downclimbing this kind of slab without a nice, level plateau below, is more of a challenge. Two adults can easily do it, if one is left below the slab to provide some support for the feet of the climber coming down (using hands). I helped Pål Jørgen down in this way. However, he could not support me, so I downclimbed using a couple of slings attached on the top corner of the slab as an extra hand hold. (Pål Jørgen then took this with him down). Comments: I did this climb with Pål Jørgen, age 12. It took us two hours from our Base Camp to the summit register just below the true summit. We started at 0600 and since the sun was rising behind Sunlight Peak, we had the first sunlight of the day as we came to Sunlight Peak at 0800. We spent a full hour on and by the summit. We both climbed the actual highest point, enjoyed the scenery, the sun striking Sunlight Spire and the view north. The summit is indeed most suitable as a place to sit and enjoy the summits all around. To do a headstand on the summit (as was appearently done in 1920), seems pretty insane, there is basically only one "safe" direction to get down from such a maneuver. On the summit of Sunlight Peak, we climbed the slab in the foreground. On the summit of Sunlight Peak, Pål Jørgen is enjoying the view. 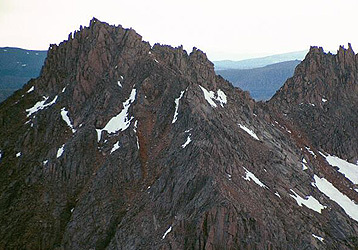 Sunlight Peak and Sunlight Spire, as seen from the summit of Mount Eolus.